The impersonation, this character wrote, must be part of an "elaborate Hasbara setup," referring to an Israeli international public-relations campaign. When Common Dreams finally confronted the man behind the deceptive posting, he denied that he himself was involved with Hasbara. His posting on Common Dreams illustrates the susceptibility of website comment threads to massive manipulation. As another illustration, he even audaciously tricked the white-supremacist Vanguard News Network, posing as "DeShawn S. Williams," a "Pro-White/Black, anti-jew." On Vanguard, where this African-American persona posted more than 1,400 times, he encouraged the malevolence of Frazier Glenn Miller, the neo-Nazi accused of killing three people whom he believed were Jews outside a Jewish community center and retirement home in Kansas in April. The character Williams was engaged in a comment thread more than 200 times with Miller, whose screen name was Rounder. In a Vanguard post under the Williams screen name the commenter asked rhetorically, "Are left wing folks finally waking up to the jew?" He then referred the Vanguard online community to a thread of anti-Semitic comments on Common Dreams--most of which he had written himself under several screen names. A typical DeShawn Williams comment might include: "Israel is a stain on the world that needs to be expunged once and for all." Or: "The jews are the most racist people on earth. Just look at their Talmud. They consider the 'goyim' (non-jews) to be cattle whose only purpose on earth is to serve them." HamBaconEggs: ". . . There are reasons beyond mere 'anti-Semitism' why these people were kicked out of 109 countries. You don't elicit that degree of anger and hostility from host populations without significantly contributing to the problem through your antisocial, predatory behavior." 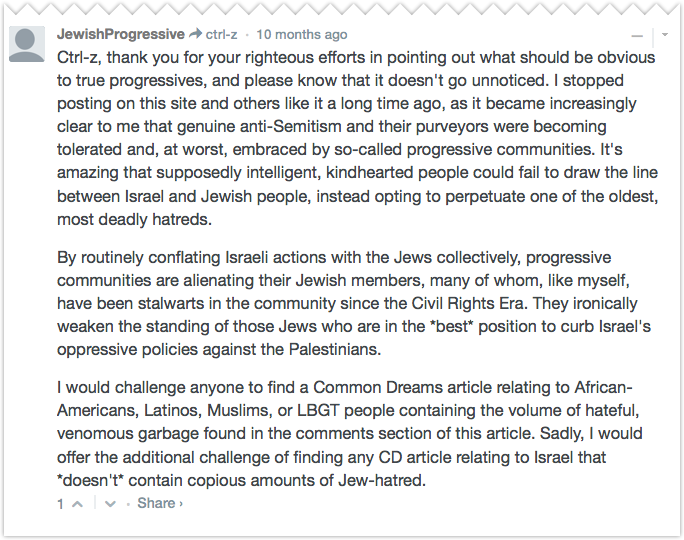 JewishProgressive replied 12 minutes later: "You are singlehandedly the most vicious Jew-hater I have ever encountered among those professing to be 'progressives.' Do you actually post about anything on CD other than 'the jews,' or is that your sole agenda? No true progressive could be so unrelentingly malicious against an entire group of people the way you are." "Oy vey! Cry me a river, you Talmudic parasite. Direct your criticism at your sociopathic tribe of money-grubbers, warmongers, and land thieves." When Common Dreams examined hundreds of posts in this ugly charade, the aim appeared clear-cut: to cast a deep shadow on, and drive support from, one of the largest and oldest progressive-news websites. The man who was the source of the charade, however, claimed he didn't want to hurt Common Dreams. It was during their daily efforts to block objectionable commenters from using the site that the Common Dreams staff got an inkling that significant manipulation was going on. The website's executive director, Craig Brown, was personally appalled at the anti-Semitic comments--and had a financial motivation to block these commenters. One generous funder had told him, he said, referring to the stream of anti-Semitism, "I gave you five thousand dollars last year, but I'm not doing it again." "We've had hundreds of donors say similar things," Brown added. "People are right to be offended by the anti-Semitism, and it has a serious impact on our reputation and our fundraising." But when Common Dreams tried to block DeShawn, HamBaconEggs, et al, they kept coming back. One day when Brown was looking at the IP address of an offensive commenter he noticed that commenters using other screen name had the same IP address. "We eventually found," he said, "that many, many different comments were coming from a very few IP addresses." Next, Brown plugged the IP numbers into one of the specialized search websites--cqcounter.com/whois/--that give a non-numerical "name" of a computer and the name and location of the company, government agency, university, or other institution providing internet service to that computer. Many of the IP addresses turned out to be camouflaged by being sent through internet "proxy," IP-address-hiding services, such as ZenMate.com. Those IPs led only to the proxy websites. But sometimes the IPs didn't lead to proxies. Sometimes--presumably when the poster just didn't take the time to go through a proxy--they led to an internet-service provider in a Midwestern city or to a university campus in that same city. That's how Common Dreams determined that one major, constant stream of anti-Semitic posts--as well as posts condemning the anti-Semitism--came from a few, close-in-proximity computers. Then a big mistake was discovered. Comments under the screen name HamBaconEggs and a few others had occasionally been posted from an IP address with a name that included a personal email address and a university domain name. Email addresses are often part of the user names given to students and faculty by a university to enable them to access the institution's computer network. A few minutes on Google, Facebook, and LinkedIn led Common Dreams to the owner of the email address, a graduate student at the Midwestern campus. The student also had made the same mistake by using a university computer that had the name of his tiny academic unit. Let's call the student Jason Beck. Common Dreams is not revealing his identity because, as a Jew who for years tricked Vanguard News Network, a major neo-Nazi website that has harbored people committed to violence, he could be put in danger by such a revelation. Beck nervously denied everything and hung up when he answered a phone call from this reporter, who then informed him by email that "soon" university officials would be told about what he was doing, including his use of a university computer for his posts. The email listed a few of his online aliases. Minutes later, Beck replied by email with an apology to Common Dreams, which he continued in subsequent emails and phone interviews. Beck said he got involved in an "ill-advised intellectual exercise," using "extremely poor judgment," that became a "psychological obsession," a kind of "tic." It was a particular "error in judgment" to use the university's computers. His aim, he claimed in one email, was "to gauge how pervasive anti-Semitism really was on websites like CD." But his "psychological obsession" explanations about his Common Dreams postings were inconsistent with another explanation he had made in his initial confessional email and in an interview. He had admitted that he had begun commenting on Common Dreams and other sites because "I became frustrated some time ago with what I perceived to be the blurring of criticism [of] Israel and anti-Semitism"on these sites. Indeed, most of Beck's comments on Common Dreams followed stories critical of Israel. For a long time progressives in the United States and abroad have strongly criticized--including on Common Dreams--Israel's treatment of Palestinians and what progressives see as the American government's no-matter-what support of Israel. In return, many Israelis and American Jewish organizations have expressed concern about left-wing criticism. Also putting in doubt Beck's "obsession" explanations were the references that his characters made in multiple postings to Hasbara, the effort by the Israeli government and private groups to generate a positive image of Israel--and attack detractors--internationally. These references looked like a toying with his deception, revealing it while not revealing it. But Beck insisted his was totally a lone-wolf operation. In his statements to Common Dreams, Beck repeatedly used formal, limit-your-expression-of-guilt words like "ill-advised" and "personal indiscretion." In one email, he wrote: "The experience of having my personal identity traced down has certainly deterred me from continuing to engage in this sort of posting." He didn't use many words suggesting that what he did was unethical. The professor in charge of his academic unit, who said he was "devastated" to hear what his student had done, described him as "the sweetest guy you can imagine." Craig Brown had another perspective: "Playing games with anonymous internet identities is juvenile. Massive, hateful, damaging fraud is outrageous." This Hasbara that Beck's characters brought up and that he denied being involved with--what is it? Numerous other commenters on Common Dreams and other news websites refer to Hasbara. The word means "explanation" in Hebrew, and it's somewhat synonymous with "p.r." It's used to mean the Israeli government's specific public-relations efforts to influence opinion across the globe through news and social media, but the word also has come to encompass a slew of private efforts to help generate good publicity for Israel and to defend it from, and attack, critics. To put Hasbara in perspective, Israel is hardly alone in using news and social media to try to influence foreign opinion. The United States calls it "public diplomacy." Those are polite words--like Hasbara--for propaganda. China's 50 Cent Party online commenters are perhaps the most notorious internet propagandists because they work openly on the domestic population. Jewish and evangelical-Christian groups and other organizations outside Israel have long promoted Israel's interests--some by attacking what they perceive as bias in newspapers and on television and radio. In the U.S., the Committee for Accuracy in Middle East Reporting in America (CAMERA), founded in 1982 (with a newer offshoot, CAMERA on Campus), has aggressively pushed pro-Israel narratives in American news media. Israeli-government-promoted internet activism--reactive and proactive--is a newer effort. News reports show it was ramped up in recent years, in step with other governments, including the U.S. government. Some civilian Israelis apparently are paid by the government to work the internet. The Associated Press reported from Jerusalem last year that the government was "looking to hire university students to post pro-Israel messages on social media networks." But internet activism--by the nature of the medium--cannot be controlled by any government. "Today many supporters of Israel worldwide are becoming digital ambassadors," Neil Lazarus, a prominent Israeli public-relations consultant to the government, wrote in the Times of Israel in 2012. "The internet is transforming the battle lines of Israel's public relations war. . . . As Hasbara becomes a grass-roots movement, the very essence of the relationship between Israel and Diaspora Jewry is being transformed." Lazarus, in fact, has teamed up with the pro-Israel website HonestReporting.com to train "digital ambassadors" globally to promote Israel's interests online. The website claims 3,000 such ambassadors, a number Lazarus confirmed in a phone conversation with Common Dreams from Israel. American and European left-wing news sites--in particular their comment threads--have long been a special headache for many Israelis. In a 2010 paper, "Anti-Israelism and Anti-Semitism in Progressive U.S. Blogs/News," Israeli writer Adam Levick claimed that "Israel is demonized" on progressive sites. Levick is managing editor of CIF Watch: "monitoring and combating antisemitism, and the assault on Israel's legitimacy, at [the news website of] the Guardian and its blog, 'Comment Is Free.'" On progressive sites, "Jew-hatred, in both its classic and anti-Israeli forms, manifests itself," Levick wrote. The anonymity of bloggers and commenters, he added, provides "moral impunity." His paper was published online by the Jerusalem Center for Public Affairs, a think tank. Within the U.S., pro-Israel internet promotion isn't a secret. Andrea Levin, executive director of Boston-based CAMERA, the watchdog over the American news media, told Common Dreams that her group encouraged people to post "talk-backs" in internet forums, but to be always "factual and courteous." So where did Beck's campaign fit into this picture? It was far from the factual and courteous discourse that CAMERA claims to promote. It was a brutal, destructive lie. Levin felt the kind of thing Beck did was rare--observing, however, that the internet "can really leverage . . . craziness in a big way." Similarly, the media-relations director at the Anti-Defamation League in New York, Todd Gutnick, dismissed Beck-type internet commenting: "Any idiot with a computer can do something like this." In the Internet Age, Beck's kind of campaign seems to many people to be unavoidable. What he did had no connection with Israel, Gutnick asserted. But Beck's campaign had a connection with Israel--just a different one than the state-sanctioned connection Gutnick meant. There's no evidence that any Israeli official or pro-Israel organization encouraged Beck’s actions, which in his own word were "stupid." They also were highly risky, as he discovered. And his posting on Vanguard can't easily be explained by invoking Hasbara. Beck was likely involved in his own personal beyond-Hasbara campaign. In the Internet Age it's easy for anybody to develop his or her own way of trying to do propaganda for any country--with, sometimes, very destructive results. Israel has encouraged its supporters--and not just Jews--to speak out on its behalf in many media, including the internet. But Neil Lazarus in his 2012 article may have pointed his finger at a lesson that could be drawn from Beck's campaign: "The downside to digital diplomacy is that Israel is losing control over a centralized message." Surely, Beck's campaign has in the end demonstrated a downside to "digital diplomacy"--and a lesson not just for Israel. Beck went far beyond diplomacy into counterproductive digital warfare. Beck may have shown the future, unless defenses are mounted. As the ADL's Todd Gutnick said, "Any idiot with a computer can do something like this." But Beck is highly intelligent--at least in some ways. Think what a team of Becks could do.